We’ve had a few sunny days in a row and this has been reflected in the growth in the pumpkin & squash patch. This year, I raised three varieties from seed and they are all doing really well (‘Thelma Saunders Sweet Potato’, ‘Burgess Buttercup’ and ‘Butternut Chieftain’). There are quite a few pumpkins set already, some growing quite round and fat. We planted and sowed most of our cucurbits in the native garden this year, and already I can see that it was a very sensible choice. In previous years we’ve tried the back paddock (too dry and windy), in the main vegetable garden (too invasive) and on the grass in front of the barn (became overgrown with grass). The native garden is sheltered and sunny, with very rich loamy soil. The worst two weeds are convolvulus and madeira vine. But I feel that I can control these two by digging them out when they come up and either leaving in the sun to shrivel up (convolvulus) or putting out in the rubbish collection (madeira vine). Our zucchini ‘Costasta Romanesco‘ is huge, the fat yellow and green fruit remind me of smooth alien guinea pigs. The hens have stirred up the wood chips around them and the zucchinis are difficult to find until they have grown too big for my liking. Costasta Romanesco is a variety grown especially for their huge male flowers, which can be stuffed, coated in batter and deep fried. But the zucchinis themselves also taste really good sliced thickly and fried in olive oil with sage leaves – they are much starchier than the commonly-grown zucchinis, with a lovely nutty flavour, and the sage leaves turn all crispy. Ben has been collecting plums by the tray load, halving them and freezing them free flow. This particular old prunus was here when we moved in and is quite gnarly and covered in lichen. There wasn’t much fruit last year in comparison with 2011, but this year it is completely laden with beautiful red-skinned, golden-fleshed plums. They taste the best if you can pick them when they turn purple but before they drop to the ground. Each morning when we let the hens out, they hurry over to feast on the plums that have fallen over night. There are more than we can keep up with. I eat them whenever I walk past the tree but it barely makes a difference. In the past we’ve made plum wine and plum sauce. At least if we manage to freeze a good deal of them, I’ll still have the option to do this when life isn’t so busy. The big shock yesterday was when I discovered that the leaves of our tiny dwarf cherry tree ‘Stella’ were covered in slimy little slugs. We picked them all off and offered them to the hens, but they weren’t interested. 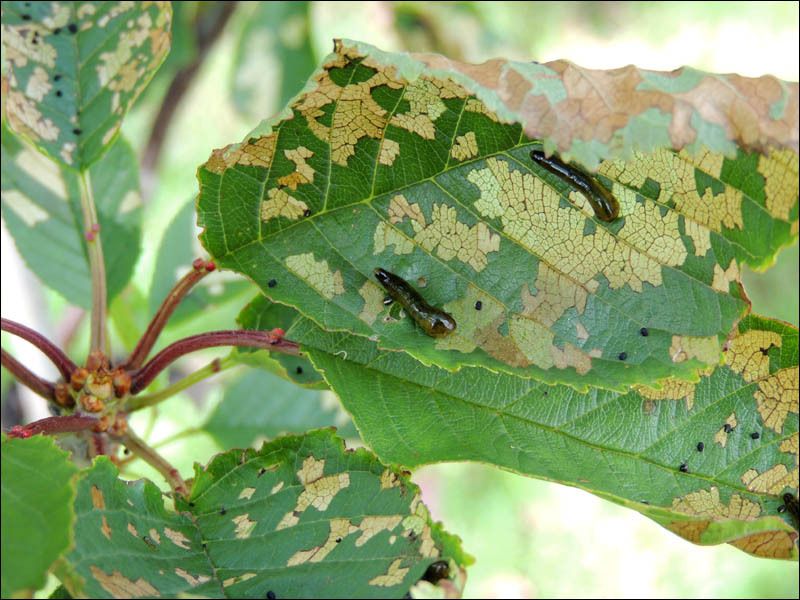 I later identified them as larvae of the sawfly (caliroa cerasi). Many of the leaves had been converted over night from healthy green to lacy brown. Thank goodness I do tend to walk around the complete garden on a daily basis. When I checked again this morning there was only a solitary slug, so it seems that the crisis has been averted. I also saw my very first ‘white-tailed’ spider, (Lampona spp.) I’m always looking for different and interesting bugs and plants so when I saw this particular spider sitting near the ceiling of our porch, I rushed to fetch my camera and a stool. I had to get really close up to take the photo and was surprised when I saw the white tip on its abdomen when I looked at the image later on. 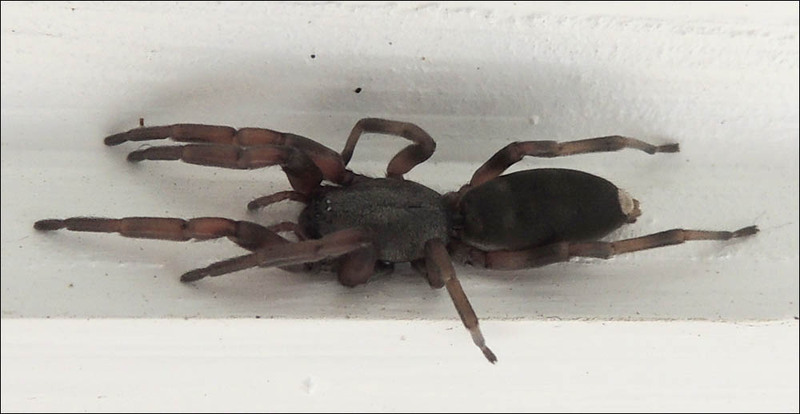 There is quite a bit of negative hype about these spiders, but from what I have read, they are somewhat maligned. It’s been a good day for power generation. At the time of writing (7.30 pm), our 2KW system has generated just under 14KWh. It has been a very hot and calm day, with the temperature ranging from 18C when I arose at 7.30 am and reaching over 30C in the sheltered patch by the bromeliad garden at around 3.00 pm this afternoon. The sweet corn is ripening in the paddock behind the barn and the maize that stretches away to the north is very tall and lush. Sitting here I can see across the Kaipara to the East. The distant hills are a hazy blue grey, sandwiched between the palest blue sky and the silvery forget-me-not blue of the water. In the foreground are our harakeke, which have flowered for the first time, sending straight spurs of rusty red flowers towards the sky. Tomorrow I have to head to Wellington for an overnight meeting. A major garden task for when I return will be to attempt to sort out part of our vegetable garden that is filled with scattered sweet-corn plants (a blackbird hen dug up most of them), self-sown Cleome (I want to plant these around the climbing beans), a few pumpkins and squashes, and other self-sown vegetables. We are going to try to move all the corn to one end before they get too tall, rescue the Cleome and make some sense of the array of other vegetables that are growing there. Looking forward to read more about your vegetable garden!